mmm looks good... I can't handle too much spice though. I'm a weeny! Sounds yummy! I do love the spicy, and that's pretty similar to the recipe I use. I think you're on the right track, experimenting with the amount of curry paste. You can always give it a dash of hot sauce, if it's not spicy enough. I love spicy food, so I think I would have enjoyed it being hot. no real hints on the heat, other than to go a little at a time with the curry paste into the coconut milk until you get the flavor you want. 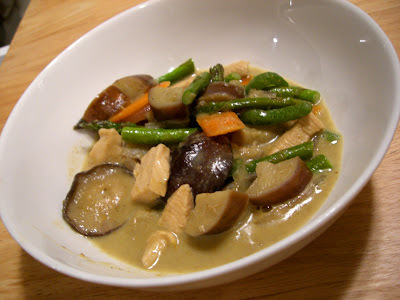 if it's too mild at the end, you can always dissolve more curry paste into a small amount of coconut milk. The green curry paste from Mae Ploy is one of their hottest. I wouldn't have thought the green would be hotter than the red, but I'm pretty sure it is. I have had that same problem, I found I keep adding the curry paste b/c I am trying to get more flavor, but the heat goes up too fast and you can add a little more sugar to balance it, but it's really hard to get right. If you can get hold of a stalk or two of lemongrass, put it in a processor with a chunk of ginger and a few shallots and garlic. Add that paste to your curry and it will add more flavor without too much heat. That's most of what's in the curry paste, minus the chilies. Though if you're going to do that maybe you could just make the paste fresh. It's actually not as hard as you'd think, if your food processor will handle something as fibrous as lemongrass! Thanks for the suggestions, soosh and Lola. I'm looking forward to trying it again and tweaking. It really was delicious aside from the firehot. I can handle a lot of heat but this was pretty serious.